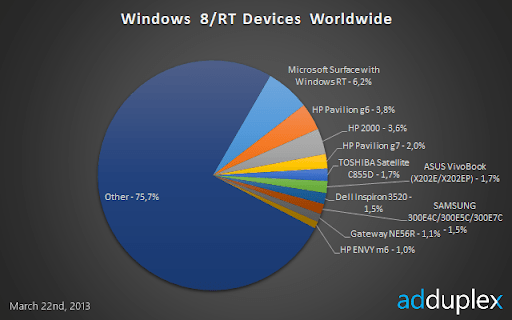 It’s time for another issue of AdDuplex’ Windows 8/RT device stats report. It was a pretty uneventful month in terms of new flagship device releases. So let’s see if anything has changed in the market positions over the month. 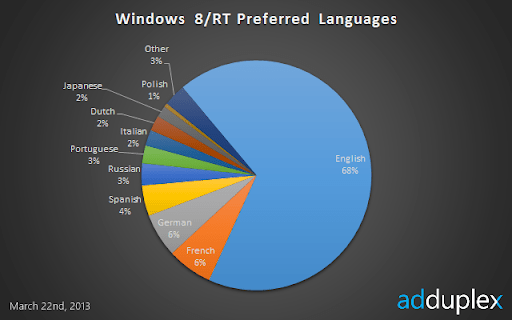 We also take a look at OS usage by countries and languages preferred by the users. This report is based on data collected from 162 Windows Store apps running AdDuplex SDK. The raw data analyzed was collected over the day of March 22nd, 2013 (UTC time). We’ve made every attempt to consolidate different reported model names under their canonical retail model names, but it’s possible that some of the rare model name variations were not accounted for. The month was uneventful in terms of new releases and you can see it in the device Top-10 list which is pretty much unchanged from a month before. The only change is HP ENVY m6 entering the chart at no.10. 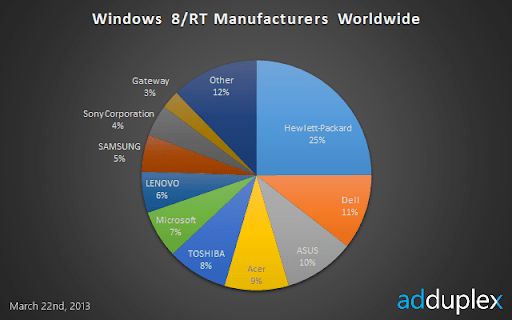 Once again Surface PRO is still not one of the 10 most used Windows 8/RT machines, but it has grown substantially from last month moving from #52 to #25. Will we see it enter top 10 next month? It’s hard to tell, but what we can say is that its usage has to grow 2x over the month to do that. Currently it has 0.5% overall market share. To put it in another perspective, let’s compare Surface RT to Surface PRO and, since PRO is still US-only, we will scope this comparison to the United States. There are about 9x more Surface RTs in active use in the US than Surface PROs according to our data. There has been quite some criticism of Windows RT from OEMs and others over the month and some defending of the OS too. Let’s look at what our data has to say about this. 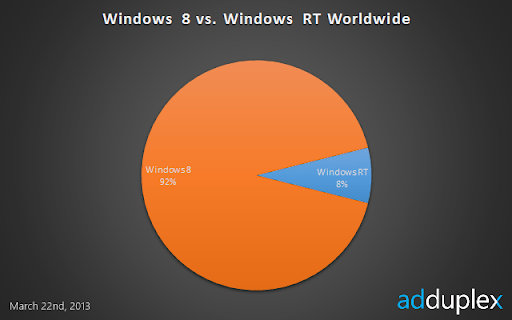 Windows RT has lost 1% of the market share compared to Windows 8 in 2 months since we last looked at this. 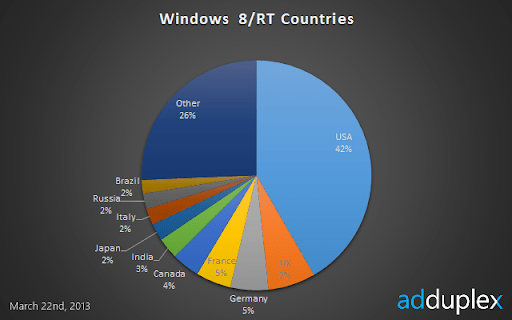 It’s worth mentioning that since we only see data from Windows Store apps and that is the only type of 3rd party apps that Windows RT users can run, the data is most likely skewed towards RT. That said most definitely it’s not more skewed than it was in the previous reports and the fact that RT didn’t lose more even though no new devices were introduced to the market in that period is either good news for RT or bad news for Windows 8 (depending on how you want to look at it). As for specific Windows RT devices, everything is almost exactly the same as it was 2 months ago. 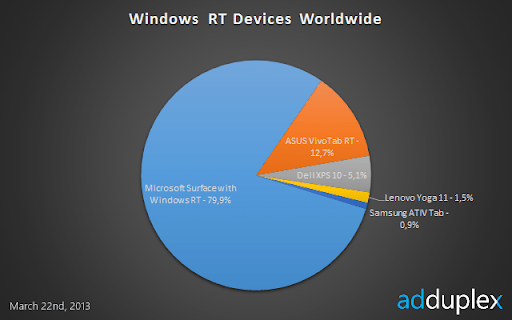 The only difference specific to our report is that we were unable to identify Lenovo Yoga 11 in time for our January report and when we did it was the least popular RT machine on the market. This time it didn’t make any waves either, but is ahead of Samsung ATIV Tab. This is not really surprising seeing how Samsung has downplayed and basically discontinued its RT offering. It looks like the situation has stabilized in the Windows 8/RT world and it’s hard to expect any noticeable changes until some new hit models are introduced by either of the players. The manufacturer chart looks like it could’ve been copy-pasted from last month with only a few minor differences in numbers. Again, not much has changed in 2 months. The market is growing evenly all over the world and we can’t notice any specific acceleration or stagnation in any of the countries. The only exception is probably United States which has grown its share from 35% to 42%. As you can see by localizing to English, French, German, Spanish, Russian and Portuguese you’ll cover 90% of users worldwide. Add Italian, Dutch, Japanese and Polish and you are 97% covered. AdDuplex is the largest cross-promotion network for Windows Phone and Windows 8 apps empowering developers and publishers to promote their apps for free by helping each other. AdDuplex was established in January 2011 in Vilnius, Lithuania. As of March 2013 more than 2,500 apps actively use AdDuplex to gain more publicity.